Zion Market Research has published a new report titled “RF Duplexer Market for Cellular, Wireless Communication, Military, FO Communication, Consumer and Automatic & Miscellaneous Applications: Global Industry Perspective, Comprehensive Analysis and Forecast, 2016 - 2022”. According to the report, the global RF duplexer market accounted for USD 4.92 billion in 2016 and is expected to reach USD 9.22 billion by 2022, growing at a CAGR of around 11.0% between 2017 and 2022. 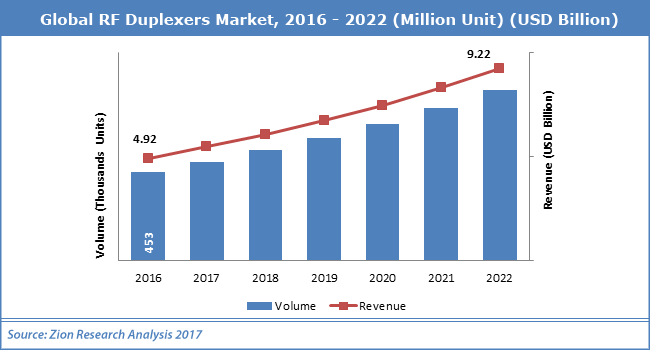 In term of volume, global RF duplexers market stood at 453 million units in 2016. A duplexer or diplexer is a 3-port device most commonly used to allow a transmitter and receiver (operating on different frequencies) to share a common antenna while operating concurrently. The filters that make up the duplexer isolate the transmitter from the receiver by doing two main functions.The most important function is filtering out any transmitter noise sidebands that are being generated on the receive frequency. The second function is protecting the receiver from transmitter carrier overload. The amount of isolation necessary is dependent upon the TX to RX frequency spacing. If the frequencies get closer, a higher value of isolation is needed. The growth of RF duplexer market is mainly attributed to growing deployment of LTE networks. In addition, rising demand for RF duplexers in wireless communication devices such as tablets and cell phones paired with advancing trends and technologies is expected to boost the RF duplexer market in coming years. However, the complexity of RF devices is expected to have an adverse impact on RF duplexer market. Even so, emerging automation trend is likely to open new doors for the market in near future. Cellular segment dominated the application segment of the RF duplexer market in 2016 owing to emerging cellular industry across the globe. Cellular application segment accounted for around 53% share of the entire market for RF duplexer in 2016. Wireless communication is expected to become a most attractive segment in the forecast period. The growth of this segment is mainly attributed to technology advancement in multiple wireless bands paired with increasing wireless communication industry.FO communication and consumer segments are expected to be another most attractive application segments in the near futures. With the largest share, North America was a leading regional market for RF duplexer in 2016 followed by Asia Pacific.North America accounted for 29% share among total share of the market and predicted to maintain a steady growth rate throughout the forecast period. A Large population of the teenage group and technological development in wireless industry is expected to be major contributing factors for the growth of RF duplexer in Asia Pacific.A region like Europe, Latin America, and the Middle East & Africa are also likely to have splendid market growth over the forecast period. Some of the major player operative in global RF duplexer market includes Murata Manufacturing Co. Ltd., TDK Corporation, TriQuint Semiconductor Inc. Avago Technologies Ltd, Ams, Broadcom Ltd., Anadigicis and Renesas amongst others.